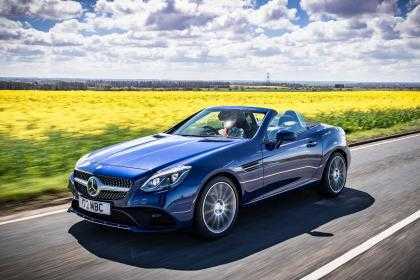 The latest one to hit stores is the Mercedes SLC 180 which now has an official price tag and the specifications of the model has also been listed. Available in stores now, the SLC 180 entry level model will cost £32,039. It is the coupe cabrio version designed to be extremely stylish in terms of looks and is powered by a 1.6-liter four -cylinder petrol engine. The powertrain is capable of producing about 154 horsepower, a performance number that should appease most buyers. In terms of sticker price, the car is quite affordable for buyers in UK unless you are going to customize it a lot to choose specific needs. The monthly plans are equally affordable as it now starts at £276. Pricing is similar to the Japanese version of the Roadster. At the moment, Mercedes offers only one trimline in the AMG range of cars as the Sport edition is not part of the SLC lineup at the moment. All the base variants of the car are now equipped with large 18-inch alloy wheels, Artico seats, autonomous braking and a cruise control system. The sports suspension system integrated in the cars enable passengers to experience a whole new level of comfort when riding, even in cabriolet mode. An equally strong performance which is on par with the design aspects is delivered to the car by the 1.6-liter petrol engine that can produce about 250 Nm of torque. The acceleration capability of the Mercedes SLC 180 is pegged to reach from 0 to 60 miles per hour in about 7.9 seconds. The car has good fuel efficiency at 48.7 mpg. The powertrain is mated to a six-speed manual transmission box but the buyer does have the option to go for a much better nine speed automatic gearbox system if they are willing to shell out £1,600. 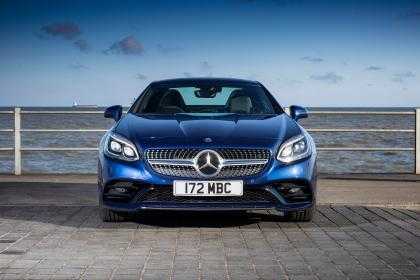 The Mercedes SLC 180 is now available for deliveries in the UK. You can pre-order the model by paying the sum and it will be delivered late summer, confirmed the automobile manufacturer. There are very limited trimline variants to choose from which also removes the issue associated with pricing. The Mercedes car can now be purchased in the cabrio model which is always an enticing option for the average owner and it is also pretty close to the pricing of the outgoing model but with much better features. The monthly option sweetens the deal further.